Warm up for an action packed winter with Exodus - Exodus Travels Ltd.
1 July 2013 - With Team GB gearing up to the 2014 Winter Olympics, there’s no better time to book a winter activity holiday. Leading adventure tour operator Exodus has just launched its new Winter Adventures brochure, which includes 14 brand new winter holidays, featuring everything from Olympic bobsledding in Norway and ski racing in Italy to whale watching in Iceland. Perfect for beginners, Exodus has expanded its multi-activity winter holidays with new trips to the Dolomites and Canada, offering a range of exciting winter activities including snowshoeing, dogsledding, downhill skiing, snowmobiling and ice skating. 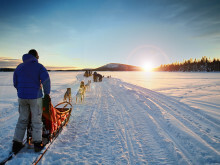 Following popular demand, Exodus has also developed its range of specialised itineraries with new cross-country skiing trips in Finland, Italy and Switzerland, new snowshoeing tours in France, Italy and Bulgaria, and a new dogsledding adventure to the Arctic borders of Norway, Finland and Sweden. Iceland is a great winter destination. The desolately beautiful volcanic landscape - impressive enough at any time of the year – is fantastic in the cold months, when there are relatively few tourists. It is also visited by many whale species, from the orcas off the Snaefellsness Peninsula to the minke and humpback whales in Reykjavik's old harbour. Travellers will split time between these two locations to experience variety both on and off shore. Add to that our efforts to catch the northern lights and you have a truly memorable few days. First departure 30 January 2014. Priced from £1,399 per person for five days including flights, accommodation, two whale watching excursions, two northern lights excursions and most meals. Immense stretches of wilderness, reliable conditions and plenty of daylight have ensured Canada's unparalleled reputation as a top winter activity holiday destination. This trip starts in Montreal in time for the city’s Winter Festival before heading to the Lac Simon region. Here, travellers will enjoy snowshoeing , ice-fishing, cross-country skiing, and skating on the famous frozen seven kilometre Rideau Canal, and will help build a quinze (a traditional snow-shelter). 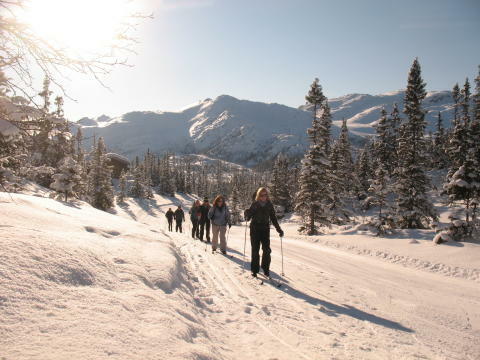 The last day in this wintery paradise offers optional activities such as dogsledding and snowmobiling. First departure 25 January 2014. Priced from £1,999 per person for eight days including flights, accommodation, activities and most meals. One of the world’s most famous cross-country ski races, the Marcialonga is a real challenge. Racing over 70km of tracks, there are now over 7,000 professional and amateur skiers competing in the Italian Fassa and Fiemme valleys. Starting in Moena and finishing in Cavalese, the race winds its way through quiet mountain villages and quaint valleys, flanked by the towering peaks of the Dolomites. Based in the lovely town of Moena, Exodus skiers will be ideally located to train for the event during the week, receiving daily cross-country skiing tuition from experienced leaders, who take skiers out to explore the race course and the Dolomites. Departs 20 January 2014. Priced at £1,499 for eight days including flights, half board accommodation, five days ski instruction/guiding and race entry. Minimum age 18. 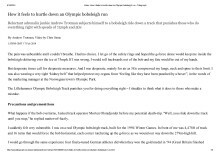 With the February 2014 Winter Olympics promising to be full of excitement for UK audiences, this year will be the best year to try a biathlon (a popular Olympic event consisting of cross-country skiing and rifle shooting). The week focuses on skating cross-country skiing technique, and every day consists of a mix of instruction and touring on some of the 200km of cross-country trails in the scenic valleys of the Sextner Dolomites. In the evening, the hospitality of a family-run hotel awaits, along with great local food and a relaxing spa. Departs 08 February 2014. Priced at £1349 per person for eight days including flights, accommodation, instruction and touring and most meals. Minimum age 18. For more information or to book, visit www.exodustravels.com or call 0845 863 9601. 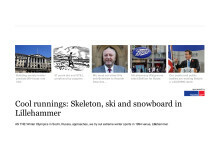 A the Winter Olympics in Sochi, Russia approaches, Anil Dawar tries cool runnings in 1994 venue, Lillehammer. Daily Express.